Visitors come to Lake Mamie to experience its beautiful scenery, as well as exciting outdoor activities including abundant fishing, scenic camping, and picturesque picnicking. Lake Mamie is located just outside of town in the Mammoth Lakes Basin. Pack your basket and enjoy lunch at Lake Mamie’s scenic picnic grounds. 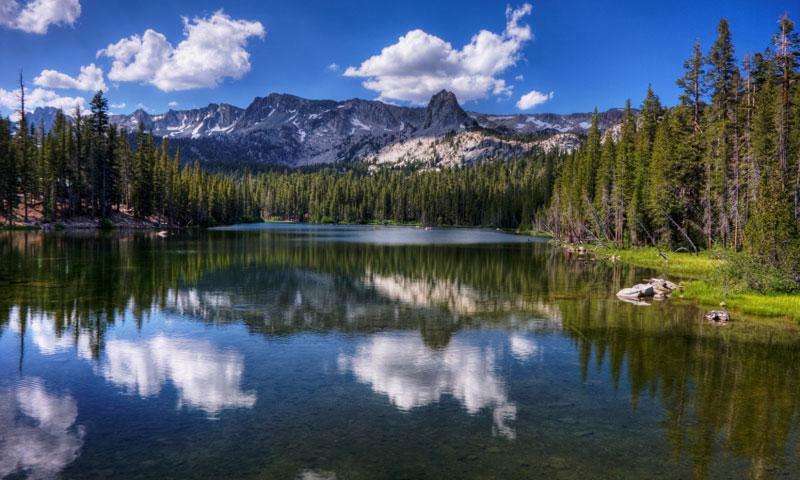 Though Lake Mamie is the smallest lake in the Mammoth Lakes Basin, it still packs in plenty of jaw dropping scenic views and exciting outdoor activities, including abundant fishing, scenic camping, and picturesque picnicking. Lake Mamie is located just outside of town in the Mammoth Lakes Basin off of Lake Mary Road. Lake Mamie is best known for its fishing as the lake is regularly stocked with large brown and Alpers trout. You can either choose to fish from shore or head out in a boat or float tube. Locals say that dusk is the best time to fish the lake. Lake Mamie has several picturesque picnic areas located just above its drainage to Twin Lakes. There are no camp sites directly on Lake Mamie, but the Mammoth Lakes Basin has many options. For your best bet at nabbing a site, head to the campground at Twin Lakes, the largest campground in the area with 95 sites. Lake Mamie is a great place to enjoy the water by kayak and canoe. Remember, all the lakes in the Mammoth Lakes basin are closed to swimming, so make sure to stay in the boat.